58 South Molton Street. That's where it all started, in London's Mayfair, in 1973. Not just any hair salon, stylists at Molton Brown bucked the norm, emphasizing natural craftsmanship and beauty over prevailing trends. Finger drying was used in place of hair dryers, and trends were ignored in favor of developing each customer's individual sense of style. 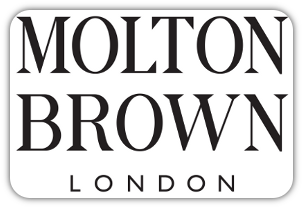 You knew it wouldn't be long until those in charge decided that service wasn't enough - the stylists at Molton Brown needed actual supplies that lived up to the supreme, soft, individual, and natural standards of Molton Brown. By the 1980s these supplies were being regularly sold to those in the know. Today, there are more people "in the know" all across the world. And if you didn't know - now you know! Beyond luxurious shampoos and conditioners, at the heart of Molton Brown's current product lines are bath and shower gels, a winner in the 2009 Allure Best of Beauty Awards in the "best splurge" category, as well as hand washes and lotions, demanded regularly by some of the world's top chefs and many others "in the know."